Probably because of the excessively cold weather there were some empty seats in the Orangery when we welcomed the Tallis Chamber Choir and their conductor, Philip Simms, for the eleventh time. Those who failed to come missed a real treat. This year’s programme was less cosmopolitan than usual as the composers and arrangers were predominantly Anglo-Saxon (if we may count Americans as Anglo-Saxon) and the pieces were mainly traditional English carols. There were also the customary readings, which included three extracts from The wind in the willows by Kenneth Grahame, who lived for many years in Phillimore Place. The readings were again by members of the choir, except for one by our own Joy Puritz. A novelty was a keyboard to accompany the choir in some of the pieces. The choir started with an arrangement by David Willcocks (b.1919) of a traditional carol, Masters in this hall, with words by William Morris. This was followed by the first work by Thomas Tallis (1505-85) which the choir have ever performed for us, O nata lux de lumine, probably written in 1575, and not typical of Tallis in that it is mostly homophonic and chordal. 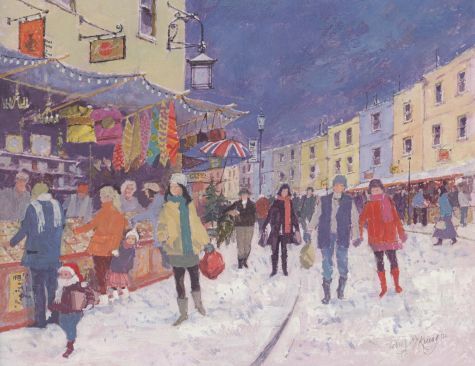 There were then two more traditional carols, There was a pig, arranged by Imogen Holst and What child is this, the music being an arrangement of Greensleeves by two American composers, Alice Parker (b.1925) and Robert Shaw (1916-99). 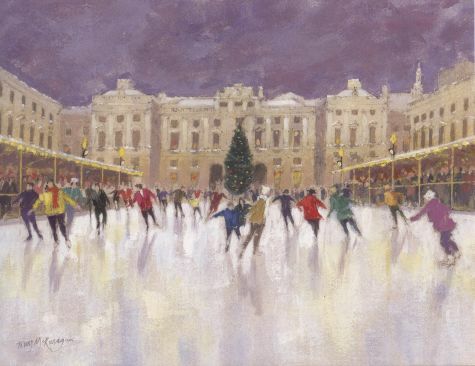 The next piece was an arrangement of a German carol Still, still, still by Philip Ledger (b.1937), who was Artistic Director of the Aldeburgh Festival before becoming Director of the choir of King’s College, Cambridge for nearly 10 years, and then Principal of the Royal Scottish Academy of Music and Drama for some 20 years until 2001. The first half ended with one of the most popular compositions of Michael Head (1900-76), The little road to Bethlehem, a gentle and affectionate carol with words by Margaret Rose. The second half began with A hymn to the Virgin, one of Benjamin Britten’s earliest works, originally written while he was serving a spell in the sanatorium at Gresham’s School in Lowestoft, and one of only two of his own pieces performed at his funeral service in 1976. It is antiphonal in form and close to traditional English church music. Next we had Jesus Christ the apple tree, a mystical poem written by an unknown late 18th-century American and set to music as a carol by Elizabeth Poston (1905-87) with a very pure folksong-like sound. This was followed by an arrangement by John Rutter (b.1945) of the Wexford carol which originates from County Wexford and dates back to the 12th century and is thus one of the oldest extant carols in the European tradition. Then, as light relief, there was a setting of The goslings by Sir Frederick Bridge (1844-1924), for many years organist at Westminster Abbey, which combined Edwardian humour with Victorian sentimentality. As a finale we had Philip Simms’ own arrangement of When you wish upon a star by Leigh Harline and Ned Washington from Walt Disney’s Pinocchio. The carols sung by the choir were interspersed with four carols sung by the audience which was in pretty good voice. The musical part of the evening was completed by an encore, Philip Simms’ arrangement of Irving Berlin’s I’m dreaming of a white Christmas, without which no Christmas carol concert for the Friends would be complete. Finally we had the pleasure of the wonderful food produced by Janice Miles supplemented by excellent drink. Once again it was a most memorable and enjoyable evening. 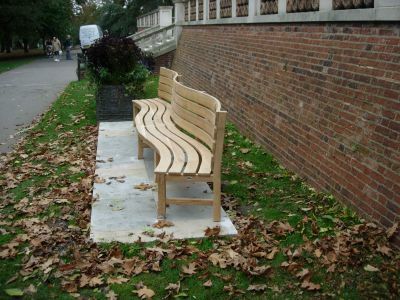 For several years we have been trying to obtain a pair of ‘wavy benches’ to be donated to Holland Park and sited one on each side of the steps in front of Holland House. On Tuesday 12 October they were delivered and installed. New Dawn Furniture (www.newdawnfurniture.co.uk) from Emsworth in Hampshire was discovered at the Chelsea Flower Show in 2008. It stood out at the time as the only exhibitor prepared to offer us a bespoke service. 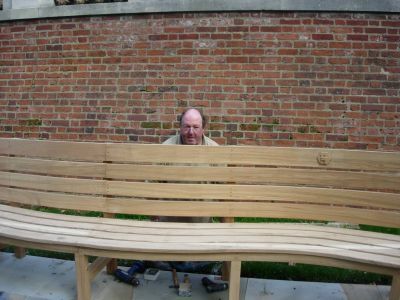 Designed to our specification by Sylvia Wingham and made by her husband Dennis, the 13’ benches have been made from English oak sourced from Petworth Park. The carvings of the Holland House ‘H’ were designed and carved by Peter Clothier of Petworth. Our photos below show the benches during installation by Dennis. The photo below shows Mrs Rhoddy Wood and Nicholas Hopkins, respectively secretary and chairman of The Friends, Councillor Nick Paget-Brown, Mrs Priscilla Fraser, immediate past chairman of the Holland Park Advisory Group, and Councillor Deborah Collinson, member of the Advisory Group. John Watkins, Head of Gardens and Landscape in the Conservation Department of English Heritage, said he was delighted to be in Holland Park again: 30 years ago he had lived nearby. 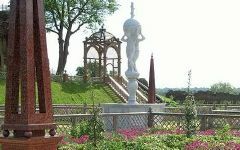 He was in the Orangery on 11 February describing to us, with many illustrations, the reconstruction into its Elizabethan form of the garden at Kenilworth Castle in Warwickshire. It is one of the oldest gardens to be reconstructed, and finding out how the garden had looked in 1575 was like a detective story or a jigsaw puzzle. We were shown Turner’s painting of the castle, representing it as a picturesque ruin. Originally well defended with a Norman keep, and surrounded by mere and bog, it was given to Robert Dudley, Earl of Leicester, by Queen Elizabeth I. They had known each other as children, both imprisoned in the Tower of London. Elizabeth made him Master of the Horse, a position of great trust. Dudley added the “Renaissance Wing”, and it is thought that he made such changes and had the garden newly designed to impress his Queen, whom he probably hoped to marry and who often visited and inspected the work. After the Civil War the castle was made “indefensible”: the mere drained, the keep demolished and, unfortunately, the garden was also destroyed. In the 1970s a garden of hedges was reconstructed, but based on a plan of 50 years after Dudley’s garden. With the help of a grant from the Wolfson Foundation, English Heritage undertook the restoration of the Elizabethan garden. A geophysical survey and the digging of trenches uncovered boundaries, a terrace, the foundations of the Elizabethan fountain and even a mediaeval tilt yard. Letters by Robert Laneham, a mercer at Dudley’s court, written to another mercer, described the appointment of the garden. The terrace sported white bears perched on spheres and had an arbour at each end, each quarter of the garden had a porphyry obelisk at its centre (or, more likely, a wooden one painted to look like porphyry which was extremely expensive), there was an aviary and, the crowning glory of the garden, a marble fountain in the form of a statue of two athlants, back to back, holding up a globe from which jets spouted water. Scenes from Ovid’s Metamorphosis were carved into the panels around the plinth of the fountain, but Laneham only describes five out of the eight panels, so the restorers had to choose some sea scenes from Ovid’s work to fill the gaps. As there was no record of the importing of such a statue, it is assumed that it was hewn in England. Laneham describes what it was like to be in the garden: the scents of flowers and the strawberries (the latter grown as edging for the plots), the fluttering of birds, the streaming of water from the fountain. Knowing what flowers would have been grown and which colours of those flowers would have been available in 1575 involved a lot of careful research. Contemporary paintings, dress materials and tapestries depicting flowers were consulted. Plants were by the 16th century regularly imported from Italy and the Ottoman Empire, and some were beginning to come from America. So there would have been pinks, carnations, gilly (wall) flowers, stocks, sweet rocket; the hedges might have been mixtures of sweet briar and field rose; and the climbing musk rose would probably have decorated the arbours. Kenilworth Castle Garden is now the largest Elizabethan garden in existence. John Watkins told us that it is open all year round, but in winter the fruit trees and the fountain are wrapped in a protective fleece. He gave us a fascinating and detailed description of the tremendous work done to restore this historical garden. Some years ago we were able to offer for sale jigsaws depicting a Holland Park peacock in full display. These are now available again and we have added a beautiful new jigsaw of the Kyoto Garden. Both are high-quality, finely-cut wooden puzzles of approximately 250 pieces measuring 360mm x 250mm. Made for us by Wentworth Puzzles, they contain unique “whimsy” pieces shaped to reflect the image theme, and will happily challenge you for hours. They are packaged in a smart shrink-wrapped box with the puzzle’s picture on the lid – ideal for presents. 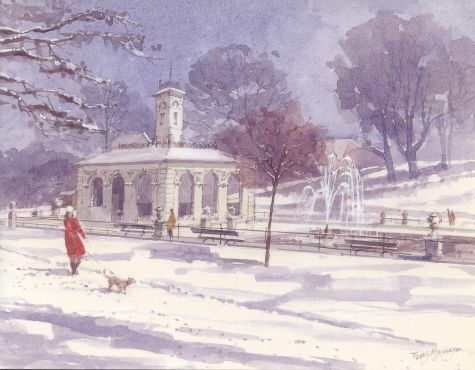 Wednesday, 30 March 2011 at 7.30 pm in the Orangery Our Annual General Meeting gives our membership the chance to hear what your committee (the trustees) has been doing in its work on behalf of the Park, and to learn what it hopes to achieve in the current year. It is also a good opportunity for you to meet all the trustees in person and to tell us of your thoughts about, and concerns for, the Park. The meeting will be chaired by our president, Sir Angus Stirling. We are very grateful to all our members without whom there would be no Friends. It is your impressive numbers (nearly a thousand) which give us influence among the Councillors who make policy and ensure that we are at least listened to if not always agreed with. We hope you will all want to renew. The Friends’ subscription year is the calendar year, so now is the time to pay for 2011. Over half of you give us standing orders, payable on 1 January, and to these we say “thank you” and you need do no more. To the others, please use the order form and make your cheques payable to The Friends of Holland Park. Minimum dues are £12 or £9 for seniors. The only exception is that those who have joined since 1 September have their membership valid for 2011. Over half of you have also signed Gift Aid forms, which means that the Friends can reclaim 28p in the pound from HM Revenue and Customs, and this adds up to over a thousand pounds a year. If you find a Gift Aid form with your newsletter, please sign and return it if you pay UK tax. If you don’t pay tax and tell us, we will try to ensure we do not ask again. Thank you. 18 Stafford Terrace (Linley Sambourne House) is a unique surviving example of a London late-victorian town house. Home to the Punch cartoonist and illustrator Edward Linley Sambourne, the house retains much of its original decoration and furniture preserved by successive generations of the family. Given a fashionable artistic makeover by the Sambournes when they moved into the house in 1875, it also doubled as Linley's studio and workplace. This illustrated talk by Senior Curator Daniel Robbins tells the fascinating story of the Sambournes and their life at 18 Stafford Terrace, one of Kensington's hidden jewels. Tickets for this event may be purchased by everyone using the order form under Downloads at £12 each to include wine and canapés which will be served after Daniel’s talk. We were fortunate to have the Tallis Chamber Choir and their conductor Philip Simms with us once again to entertain an audience of some 120 in the Orangery with the usual combination of familiar and unfamiliar carols from the Netherlands, France, Germany and the Basque country as well as the United Kingdom. We started with an old faithful, Hodie Christus natus est by J.P. Sweelinck (1562-1621), a leading Dutch composer and organist and a precursor of J.S. Bach. This was followed by the first of two carols by the French composer Francis Poulenc (1899-1963), which were two of four pieces written 1951-52 under the title Quatre motets pour le temps de Noël, and were challenging for both the choir and the audience as they were atonal in parts. Then followed a beautiful and tuneful carol by John Rutter (b. 1945), which brought us back to familiar territory. We then had another traditional-sounding carol by Edmund Rubbra (1901-86), a prolific English composer, whose music is rarely performed these days. The first part of the concert ended with a carol by Peter Gritton (b. 1963), an English composer and the current Director of Music at St Paul’s Girls School, which had the feeling of 1930s swing music – perhaps not surprising as he has composed two musicals and backing tracks for Sting. The second half started with the well known In dulci jubilo, a 14th-century German carol in the arrangement by R.L. Pearsall (1795-1856), an English barrister turned composer who emigrated to Germany in 1842 and later moved to Switzerland. This was followed by a Basque carol, I saw a Maiden, and then by an African song Kwmbayah, arranged by K.J. Dinham, a very jolly and happy piece. We finished with two old favourites, Ding dong merrily on high and Philip Simms’ arrangement of Have yourself a merry little Christmas, the former in a most unusual arrangement in 5/4 time by William Llewellyn (b. 1925). As usual, the choir’s carols were interspersed with familiar carols sung by the audience, which was in good voice, and also by readings, this time undertaken by members of the choir, some of whom demonstrated considerable Thespian talent. The outstanding reading was a brilliant piece, The art of sending Christmas cards, from which we could all learn a lot when considering whether and what to send to certain people. It was written by William Connor, who died in 1967, a celebrated columnist in The Daily Mirror for over thirty years under the pen name Cassandra. We are most grateful to Philip Simms for his ingenuity in devising such a novel and entertaining programme beautifully sung by the choir. At the end of a most enjoyable evening Janice Miles excelled herself with the quality and quantity of the food she produced and, as always, the wine flowed freely. remuneration or benefits from and no staff are employed by the charity. 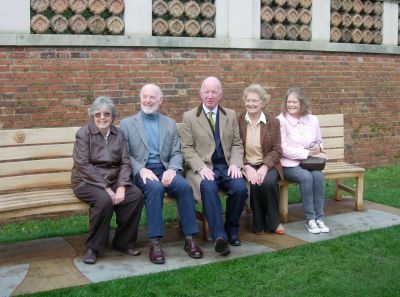 The Friends’ wish to have the forecourt of Holland House opened to the public moved yet a little closer following The Royal Borough’s successful work to conserve the remains of Holland House, which was completed in spring 2009. A planning condition imposed on Opera Holland Park required the forecourt to be landscaped after the opera season ended in September. However, little progress had been made on site by the end of the year. An appropriate lighting system to illuminate the conserved ceramic tiles under the cafeteria arches was sourced, installed and paid for during the year. However, efforts in seeking the design and production of wall hangings for use in the cafeteria to reduce noise levels again proved fruitless. The agreed donation of equipment and educational aids to The Ecology Centre was completed early this year. The owners of the Commonwealth Institute site on the Park’s southern boundary applied for and were eventually granted approval for their proposed scheme of redevelopment despite strong local and national opposition, including that of The Friends. The provision of children’s toilets adjacent to the Adventure Playground remains an unresolved issue. The twenty-seventh Annual Art Exhibition in March was supported by 85 artists, whose sales' commissions and entry fees raised £1,400 for the Friends. This was a considerable improvement on the previous year and a good result in the prevailing economic climate. Other fundraising and social events for members included two illustrated talks: ’The Birds of Bray’ in February and ‘A House Reborn’ in October. was held in the grounds of the Youth Hostel. The annual Christmas Concert was again given by the Tallis Chamber Choir. of his regular meetings with Officers. Good relations are the norm between the Council and The Friends with general agreement over objectives for the Park. The Friends will continue to monitor the Royal Borough's plans for the Park and any planning proposals, which in the opinion of the Trustees may adversely affect the Park and the public’s enjoyment of it. If the Borough’s approved plans to redevelop Holland Park School do go ahead, The Friends will seek to achieve improvements to the residential block once a developer has been appointed. It is fully expected that this year, when the opera season is over, the terraced area in front of the House will be landscaped, and hopefully opened to the public, though there are some safety and security issues to be resolved. Providing the necessary approvals can be obtained, it is hoped that an alternative approach to designing and producing the proposed wall hangings for the cafeteria will make better progress this year. 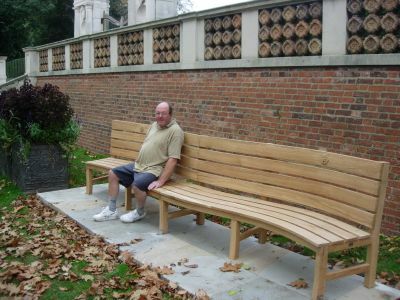 Plans are also afoot to have two new benches designed and presented to the Park and there is the possibility of work being done on a couple of new publications. 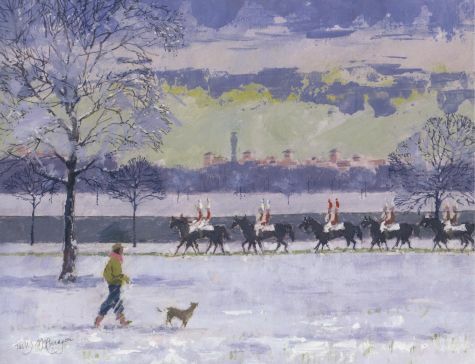 The annual Art Exhibition will run as usual this year and in addition to the normal February and October events for members the reinstated ‘Pimm’s in the Park’ party will be repeated in July. 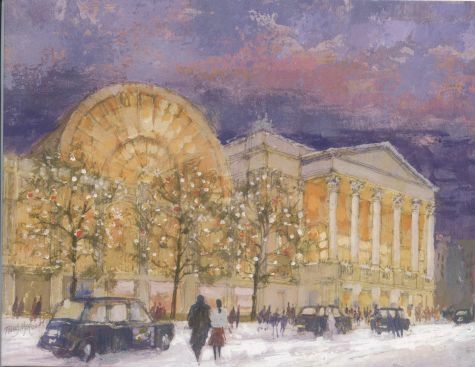 The annual Christmas Concert will take place in December to round off the year. A comprehensive review of the risks faced by the Charity was undertaken and the trustees believe that, where possible, measures are in place to reduce or mitigate the risks identified. The trustees consider that the Charity should hold a minimum reserve equivalent to 50% of annual expenditure to ensure that the quarterly newsletter can continue and other necessary expenditure paid if due to unforeseen circumstances the projected income is not received. Any reserves in excess of this are held pending expenditure on, or donations towards, projects related to the Park in accordance with the Charity’s objects. • Park projects, which the Charity has indicated a willingness to support, have not yet received final approval from The Royal Borough of Kensington & Chelsea. If all these commitments and indications are fulfilled, a substantial proportion of the reserves would be expended. We would especially like to remind you of two items available on our downloadable order form. Firstly our two jigsaws, one of the Holland Park peacock and the other a view of the Kyoto Garden. Both are high-quality, finely-cut wooden puzzles of approximately 250 pieces measuring 360mm x 250mm. Made for us by Wentworth Puzzles, they contain unique “whimsy” pieces shaped to reflect the image theme, and will happily challenge you for hours. They are packaged in a smart shrink-wrapped box with the puzzle’s picture on the lid – ideal for presents. They can be seen in full colour under Merchandise. Secondly is the book “Trees of Two Continents”. One of these continents is Holland Park, and seven walks are given within it, listing the trees and some shrubs passed. The text is simplified for beginners and there are plentiful illustrations. It is very handy for anyone wanting to learn the basic plants found in many London parks and gardens. Even many of the plants the author found in Melbourne can easily be seen here too. 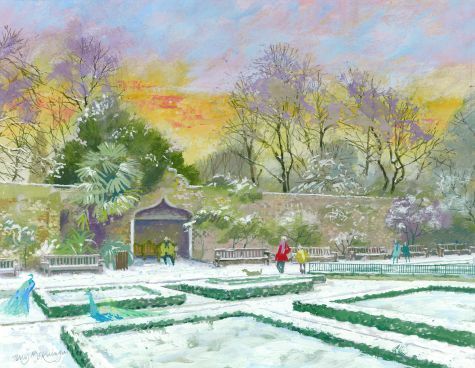 Our 2010 Christmas card is focussed on the alcove in the Dutch Garden and makes a truly seasonal view, below. 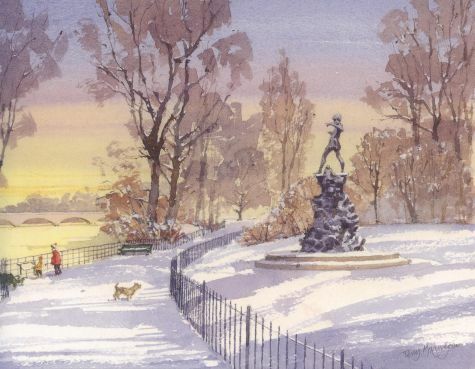 All previous Holland Park designs are now sold out, but other London scenes are still available, below. At the time of writing, your secretary has every intention of making crab-apple jelly again this year. The general apple crop seems good this year and we have checked that the two crab-apple trees in the park are bearing. They should be ready about the end of September. So do phone 020 7602 0304 to enquire about availability and prices and to arrange collection. Sunday, 5 December is definitely a date for your diary, as this is when we will again be welcoming the Tallis Chamber Choir (TCC) and their musical director Philip Simms for their annual carol concert. TCC has flourished for more than a quarter of a century now. 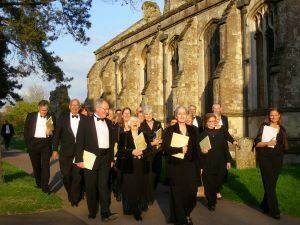 It grew out of Philip Simms’ conception of a small choir to give concerts with the English Chamber Orchestra and this grew out of the Greenwich-based Thomas Tallis Society which he founded in 1965. For 36 years Philip was organist and choirmaster at the parish church of St Alfege, where Thomas Tallis is buried, and a member of the English Chamber Orchestra (ECO) for 28 years. Since 1983 the TCC has given concerts all over Europe and the UK and made numerous recordings of works of a variety of composers and styles. The choir has not only worked with the ECO but with most other London-based orchestras, large and small. In addition it has been privileged to work with the Chamber Orchestra of Europe, Israel Philharmonic and the Gothenburg Symphony Orchestra together with an enviable number of great conductors including the late Charles Mackerras. TCC has also given a multitude of a capella concerts, with readers such as Robert Powell, Keith Michell, Margaret Tysack, Crawford Logan, and not forgetting our very own Joy Puritz. In May of this year TCC performed Duruflé’s Requiem at Wymondham Abbey, Norfolk in a highly successful fund-raising concert in aid of Help for Heroes, conducted by Philip Simms. In August Philip also conducted the choir and the Locrian Ensemble in Mozart’s Requiem in a sell-out concert at St Martin-in-the-Fields. The concert also included the world premiere of Ad Astra for soprano, choir and orchestra by Julie Cooper. This was the choir’s second concert with the Locrian Ensemble this year and they have been invited back for a further concert at St Martin’s in mid-December. The TCC are very much looking forward to being with us again – for the eleventh time. As always we advise early booking as the concert is usually sold out. Tickets are £15, including wine and canapés after the concert, and these can be obtained using the enclosed order form. You do not have to be a Member to purchase tickets. Last year David Darrell-Lambert was commissioned by The Royal Borough to carry out a survey of the birds frequenting Holland Park. This year he is our guest speaker at The Friends’ autumn evening event. David is currently Chairman of the Ornithological Section of the London Natural History Society and Chairman of the Records Committee. Since 1988 he has undertaken a variety of bird surveys in urban parks, coastal sites and heathlands, covering nocturnal species, winter wildfowl counts, high-tide roosts and breeding populations. 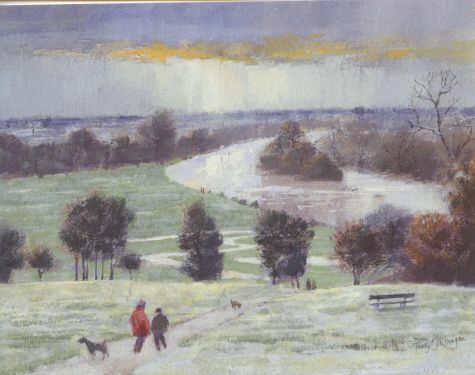 In 1991 he began illustrating the London Bird Report and then became a local bird recorder. 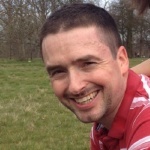 For the last eleven years he has led groups of birdwatchers around various parts of London, Essex and Hertfordshire, ranging from four to eighty people. He has expanded his identification skills to include butterflies and dragonflies, adding to his strong knowledge of British wildlife. Photography plays a large part in these activities, and his photographs have been published in a number of specialist journals. He has travelled widely at home and abroad in pursuit of his interest. His talk to us will cover the importance of Holland Park as a bird habitat, what species were present at the time of his survey, and their numbers, plus the future of the site. All the species will be illustrated by his own photographs and, where possible, by recordings of their songs. Holland Park Honey The bees of Holland park have been busy this summer and have produced over a hundred jars of honey which we have sampled and can affirm is of top quality and extraordinarily tasty. Hurry to get yours while it is still available. It is obtainable at £5 a jar in Park Reception and all the takings will go to support the aviary next year. In our Summer 2009 newsletter we reported the vandalism of the snow lantern in the Kyoto Garden. Against all expectation and despite the many fragments it had been reduced to, Park Management have succeeded in putting “Humpty together again”. Unfortunately the vandals were at it again in the Garden on 10th September: a bench was completely smashed and the smaller lantern broken. Park Management are likely to be able mend the latter. If you missed last summer’s “Pimm’s in the Park” party, don’t miss it this year! It will again be held in the garden of the youth hostel, courtesy of the manager, Sally Martyn-Johns. This is a lovely venue made even more inviting by being private for the rest of the year and only partly visible through the railings. We might even be serenaded by an opera rehearsal. If you were with us last year, then you’ll probably want to be there again. We shall be serving Janice Miles’ delicious canapés with a summertime flavour. Please order your tickets at £12 each on the enclosed order form. Learning about Nature: Holiday Activities for Children What do you do to amuse and occupy lively five to ten-year-olds over the half-term break and even more so when the school holidays arrive? The Holland Park Ecology Centre has the answer with its regular holiday activity programmes, which are not only fun but teach practical skills as well. Since these activities take place throughout the year, children learn what to look out for in the different seasons: bird nesting in the spring, the many kinds of flowers to be seen in the park throughout the summer, and the signs of autumn in the wildlife area. There are plenty of opportunities for hands-on experience too: children can learn practical conservation techniques by digging in the wildlife area or weaving, using natural objects and recycled materials. All children enjoy pond dipping and handling creepy-crawlies of all kinds, exploring the world of wriggly worms, slugs and snails. The half-term programmes, which were started over ten years ago, now attract about 160 children over the week; in the case of the under-eights they have to be accompanied by an adult. This year the spring holiday activity programme included two half-day courses (including a picnic lunch) for eight to twelve-year-olds. One was a very popular Bushcraft Course teaching outdoor survival skills including shelter building, tracking and orienteering (look to your laurels, Ray Mears!). The other course, called Minibeast Mayhem, consisted of hunting for invertebrates in the wildlife area and helping construct a new habitat for bugs, beetles and other creepy-crawlies. 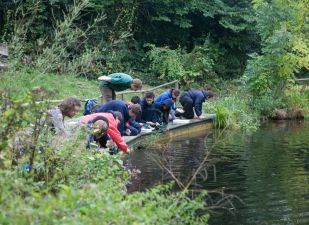 Lastly, there is also an Ecology Club, which is open to children from eight to fourteen, and which meets once a month to participate in activities exploring the natural world. So, in this the International Year of Biodiversity, the Holland Park Ecology Service is celebrating not only with a wide range of activities and talks for adults, but is also focusing on children, the conservationists of the future. Now they can learn about the natural world around them and have fun at the same time. So there is no excuse for them to be bored over the holidays. Contrary to popular perception, The Friends of Holland Park is a quite separate organisation from Opera Holland Park Friends; we are often confused with them. Nevertheless, we are happy to carry the announcement of their upcoming productions for this Summer. Pelléas et Mélisande by Debussy: June 1, 3, 9, 11, 16. Carmen by Bizet: June 2, 4, 5, 7, 8 (Charity Gala), 10, 12, 15, 17, 18, 19. Don Giovanni by Mozart: June 28, 30. July 2, 4 (matinee), 6, 8, 10, 12, 14. Fidelio by Beethoven: July 1, 3, 5, 7, 9, 11, 13. La Forza del Destino by Verdi: July 27, 29, 31. August 4, 6, 10, 12, 14. Francesca da Rimini by Zandonai: July 30. August 3, 5, 7, 9, 11, 13. For priority postal bookings join Opera Holland Park Friends. Call 020 7361 3910 or email friends@operahollandparkl.com. Online booking opens to the general public on 26 March and telephone booking on 29 March. Dr Patwardhan is a medical doctor by training and a Homoeopath by conviction, whose concentration on natural remedies reinforced her interest in plants acquired from her father-in-law. Now retired, she divides her time between her home in Pune, India, and long visits to family in Melbourne and Oakwood Court, W14. While abroad, she started to observe trees and shrubs which grew in the streets and parks near her. The idea came that she would like to produce a book that would be suitable for family and friends who were not necessarily botanically aware, thus passing on her love of plants to the next generation. The result is a fascinating study of what actually grows in and around Holland Park and the suburb of Murrumbeena, in Melbourne. In addition to the main list, walks round Holland Park are given so that readers may know what to expect border by border. There are also brief excursions into Kensington Gardens, Hyde Park and Kew Gardens. For simplicity, emphasis is on the common names of plants but scientific names have also been added and many plants have been illustrated with the author’s own photographs to make identification easy. Dr Patwardhan visited at different seasons and this is reflected in photographs taken at different times of the year, with an unusually strong collection of autumn fruits as well as earlier flowers. Those who know Holland Park might think that only half of the book could be relevant to them. Intriguingly, this is not the case because many of the species are common to both and Dr Patwardhan’s wider knowledge of Indian plants also contributes. I commend this book to all as an easy way into the study of plants which can be an absorbing pastime. Please ask for your copy on the order form; the Friends make a profit of £4.00 on every copy sold.